Join me as I remember my travels in the Canadian Arctic during the 1990s, a period when few journalists travelled as widely in the region. I started working on this tale back in 1996, thanks to a Canada Council Literary Development grant, and then put everything aside for more than 15 years. I have taken the liberty of changing some names and details to protect the many people who spoke to me freely and to safeguard myself against any possible defamation lawsuits. November 1991: I watched as the dark red apple rolled under the plane. All around me snow whipped by horizontally, lit up in swaths by the headlights from idling snowmobiles. The small plane was surrounded by half-lit, snow-covered figures. A woman with a baby on her back carefully maneuvered down the airplane’s ladder. She was carrying her newborn baby in the roomy hood of her fur-edged parka. In her arms: a plastic-wrapped package, also lovingly tended to. It was a houseplant, protected against the elements. I retrieved my apple, and discovered it was frozen. But as I bent over, another one slipped out from the bag and rolled away. Looking around, I realized suddenly, that I knew nobody, that no one had come to meet me. A strange feeling came over me, of almost panic. The plane landed at Puvirnituq, a community on the Arctic coastline of Hudson Bay, but clearly, there was no airport terminal. I didn’t really have a clue about where I was…everything was so dark and so white. I’d experienced the deep kaamos twilight of winter in northern Finland, but it had been years since I’d felt the uneasiness of a traveler in an unfamiliar land. “Sure, get in the back,” the driver said. I sat there, under the protection of my bag, watching the muted figures outside in the blizzard. I had packed that bag with care, stuffing it with soft toilet paper, coloured sweet peppers, a couple of beers, sourdough bread, fresh lettuce, all according to the requests of my friend J., but the apples had come loose and as I sat there in the dark that night I could feel the round hard lumps against my chest. The day I lost that apple began in Montreal. A blue sky, with temperatures on that Nov. 15 well above freezing. At the airport I stood out, overdressed for the weather in my northern gear, knee-high, felt-lined fluorescent boots and a parka. But, two hours later, when the plane landed at La Grande, snow, mixed with ice pellets, was already falling, and I was dressed for the day. In the year since I had last been in La Grande, midway up Quebec’s northern territory, a new terminal had been built, replacing the worn, wooden building. But the crowds inside were the same, a cross-section of Quebec, French-speaking workers from the nearby hydroelectric power project camps, clasping small bags, ready for a return south after weeks of 12-hour days, while their bosses gathered together in trench coats. In the opposite corner, Cree men stood around in leather jackets with emblems on the back, with braids and large-brimmed hats, and on the other side, there were Inuit traveling north, a few women in parkas, sitting on the floor. I had suddenly changed plans. Does she remember every traveler, I wondered. The first stop for the small airplane, a Hawker-Siddley 748, loaded with passengers and cargo: Great Whale, also known as Kuujjuaraapik in Inuktitut. Located at the point where the Great Whale River empties into Hudson Bay, the community spread out below me, flanked by endless, snowy beaches. The bay had not frozen over yet and cold waves breaking formed a blue and white edge along the sand that stretched up the coast. We had to get off the plane, crowding into the one-room terminal. A few benches lined the walls. The brown linoleum on the floor was dull and lifted in several places, revealing soiled plywood underneath. A woman approached the check-in counter with an array of bundles, wrapped up in plastic, which she dragged on a child’s sled. We reboarded the plane. 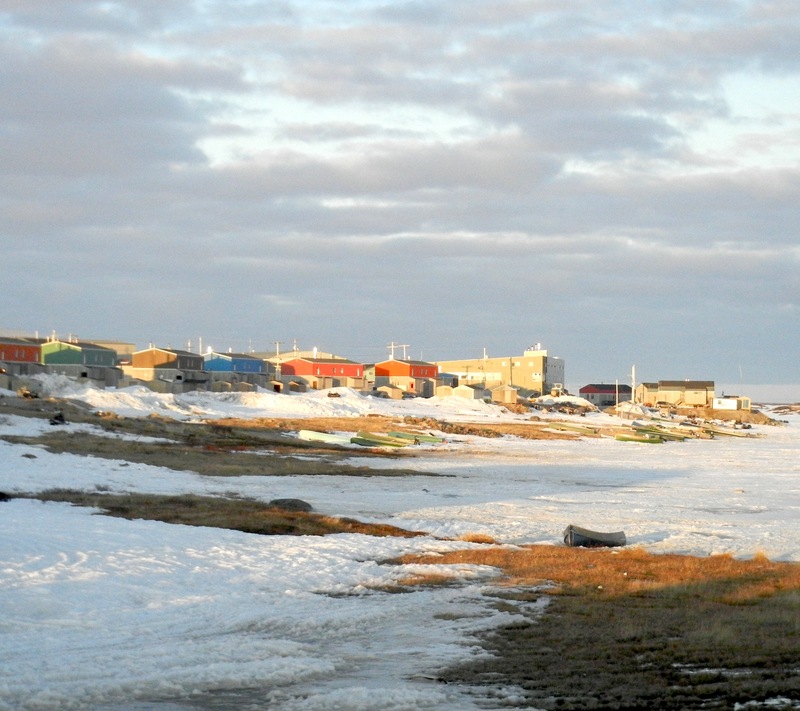 The next stop on our journey north — Sanikiluaq, the sole community on the Belcher Islands. We flew over the open water, over to a group of island-sized flat rocks. Even snow seemed to have a hard time clinging to the smooth surfaces. Suddenly, we were landing at an airport and its tiny terminal welcomed us to the Northwest Territories, the first time I’d ever thought about visiting that territory. Our next stop brought us out of Hudson Bay to Inukjuak on its coastline, at the end of the crescent-shaped northern peninsula of Quebec. We were now more than 1,000 kilometres north of Montreal, and it was late afternoon. It was getting dark out. The snow, suddenly plentiful, piled in drifts between the plane and terminal. Faces pressed against the glass, looking at our small group of passengers as we navigated towards the door. This terminal was new, a miniature version of a southern airport. There was just one room, featuring a rolling baggage rack, yellow plastic chairs and a drinking fountain. Milling around, women in amautiit parkas, traditional garments, which are generally white, cut high on the front and sides, low in the back, with a rick-rack edging, and featuring huge hoods, trimmed with garlands of fur. Almost all the women smoked cigarettes, while the heads of a couple of infants peeked up from the hoods of the parkas. There was a whole gang of Inuit boys, too. They were dressed in rocker-style jackets, high-cropped sneakers, dark glasses, no hats. Their only concession to the cold: black leather gloves. The 748 travelled north. Only soft drinks and peanuts were handed out by the attendant who doubled as a cargo hand at stops. We were already behind schedule because the crew only had 20 minutes at each stop to unload cargo and it always tool longer. But at our last stop, Akulivik, where I was to change planes for Puvirnituq, it became clear we were going nowhere. The storm had now become a blizzard. I waited, maybe three hours, in the terminal. I watched a heavy-set, tall, white man with a tasseled hat that had the name of a community, “Salluit,” crocheted into the design. He seemed to know everyone else while I knew nobody. I was jealous. The time passed. I ate the end of a sandwich that a friend packed for me hours ago, in the South. 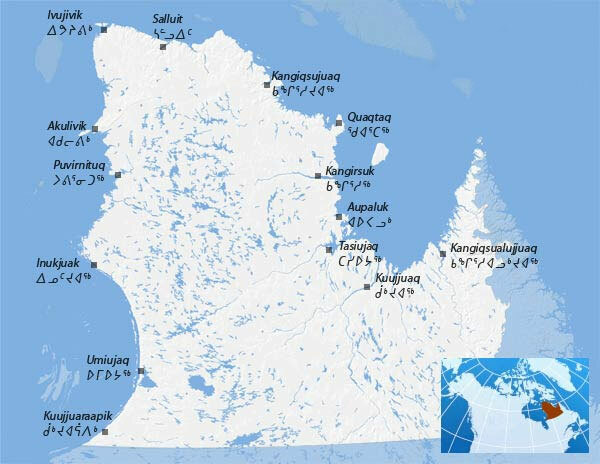 I read a copy of an English and Inuktitut-language paper that was lying around, the Nunatsiaq News from Iqaluit — although I wasn’t even sure where that was: When I was in school, that community was called Frobisher Bay. Finally the Twin Otter that would take us to Puvirnituq, then known as Povungnituk or POV, arrived. I was nearly blown away on the walk to the aircraft. Its inside resembled a trailer’s dinette, with fake wood paneling and seats that folded down. The pilot leaned through the opening which half separated the cockpit from the passengers. The plane lurched down the snowy runway. No one said anything on the dimly-lit aircraft. The noise from the propellers was too loud and it was too cold to think. I sat huddled in a corner. “How can it fly?” I wondered. 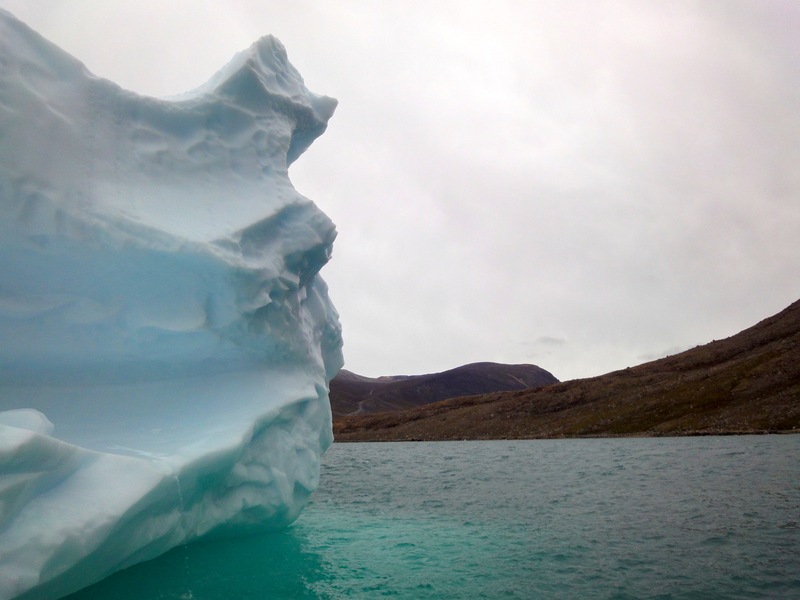 You can continue reading the series “Like an iceberg” here where you will find all the links to other posts. Few people have travelled this remote part of Canada to the extent that Jane George has, and certainly not in the 1990s. This should be required reading for all young Canadian reporters wondering where their next big adventure could be. Oh, this is going to be a fun trip – through new experiences and old memories! I’m so looking forward to it and I’m thankful that we’re getting the opportunity to share this with you, Jane, who’s spent so much time telling the invaluable stories that needed to be told.